The most dangerous time to be on the road starts the night before Thanksgiving and ends after the New Year. Why? Increase in traffic on the road. Increase in driving under the influence. More fatigued and stressed drivers. More distractions with things such as holiday lights. Alcohol-related accidents spike during the holidays. Not only that, but driving while tired can be just as dangerous as driving under the influence. Missing just one or two hours of sleep can elevate crash risks similar to risks posed by someone driving under the influence (and above the legal limit). Our roads are also subject to adverse conditions due to rain, snow and ice. With daylight savings time, there are fewer daylight hours affecting highway visibility. More pedestrians are out during the holidays and more roadway travel is occurring. All of this has the potential for leading to more car-related injuries and accidents. Avoid an accident: Drive sober, avoid distractions while driving (or walking), drive at safe speeds and reduce your following distance during congested traffic or when weather conditions are poor. Call for a taxi or rideshare service or designate a driver. 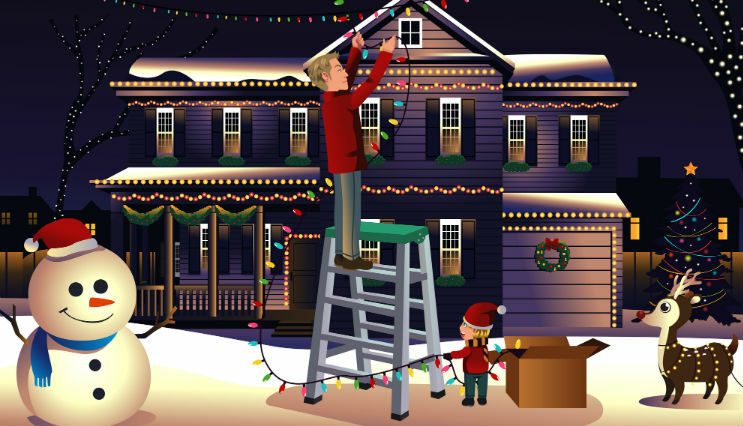 Falls from ladders are more common during the holidays as people are putting up holiday lights and decorations on rooftops and other high places. Based on a study by the Centers for Disease Control and Prevention (CDC), around 5,800 people have been treated annually for fall-related injuries associated with holiday decorating. Most were caused by falls from ladders. The Consumer Product Safety Commission says there are about 250 injuries a day during November and December with the most frequently reported holiday decorating incidents seen in emergency room departments involving falls. Falling off a ladder or step stool can result in serious injuries, especially to the back. Only use ladders approved for their height and have someone act as a spotter, especially when climbing to greater heights. Although Christmas tree fires are not common, according to the US Fire Administration, when they do occur, they are more likely to be serious. On average, one of every 32 reported home Christmas tree fires results in a death compared to an average of one death per 143 total reported home fires. Shorts in electrical lights or open flames from candles, lighters or matches start tree fires. Well-watered trees are typically not a hazard; however a dry and neglected tree can be. Watch this video clip on a dry tree versus a high moisture tree fire. Many toys have small parts that can easily be bitten or twisted off, such as buttons and eyes, causing a young child to choke, so be sure to check for small parts or choking hazards. If you are buying new electronics, keep an eye on the button batteries. Each year in the U.S., more than 2,800 children are treated in emergency rooms after swallowing button batteries. Button batteries are used in things such as remote controls, calculators, watches, key fobs, musical greeting cards, flashing holiday jewelry, decorations and more. Another thing to check for is product recalls. In 2016, there were 76 toy recalls, and a 2015 report release by the US Consumer Product Safety Commission estimated 254,200 toy-related injuries and 12 deaths that year. Make sure to supervise children using new toys, always follow the instructions and make sure it is an age appropriate toy or device. Yes, there are accidents that occur when crowds get out of control during the holidays; however, you are more likely to suffer an accident due to a slippery sidewalk or distracted walking. One of the most dangerous places during the holidays is the mall parking lot. With increased traffic from holiday shoppers, accidents tend to rise this time of year. Pay attention to where you are walking and not the device in your hand. We all love to hang mistletoe and holly or decorate with a poinsettia to show our Christmas spirit. What you may not know is that mistletoe, holly berries, poinsettias, and many breeds of Christmas trees can actually be poisonous if ingested. Be sure to keep these plants away from young children as well as pets and keep the number for poison control handy. These are a few of the mishaps and accidents that can occur around the holidays. The more you know, the more prepared you will be to avoid you or someone in your family suffering serious injury.